Knowing how to ask 'what time is it?' in French is a very useful skill. People will ask, and be asked, this question several times a week. Recognizing the phrase is the first step to answering it, and being able to ask the question will come in very handy as well. The phrase 'what time is it?' is formed with the French question word quelle, the feminine form for 'what' because the noun for 'hour' is feminine (heure), and this noun is used in the question. 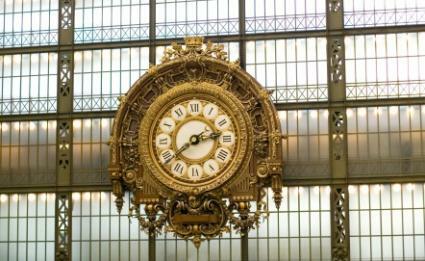 The most common way to phrase the question is Quelle heure est-il?. The word-for-word translation of this question phrase is 'what hour is it? ', so, aside from the difference in noun used (time vs. hour), the phrase is structurally very similar to the same question in English. Important things to remember in order to get the phrase right in both speaking and in writing, is to make sure you use the feminine from of quelle (quel and quelle are pronounced identically in most dialects of French), and to invert the subject and the verb to make the phrase into a question. Be sure to place a hyphen between the inverted subject and verb to show proper question formation. In addition, some students ask the question with the subject pronoun elle instead of il because heure is feminine. This is incorrect because the subject of the sentence is it; like in English, it in French is always masculine unless 'it' refers to a feminine noun (antecedent). Heure is not the antecedent of 'it' in this question; there is no antecedent-the heure and il serve different functions in the sentence. 'What time is it?' in French pronunciation goes something like this: KEL-uR-ai-TEAL. Although many French sounds cannot be perfectly expressed in English, this pronunciation is fairly loyal to the French original. One thing to look out for is that in this phrase, the 't' on the verb 'est' IS pronounced. In most situations, final 't' is not pronounced, but because the word following this one begins in a vowel, the final 't' is pronounced in order to make a kind of bridge between the two vowels (the penultimate sound of the verb and the initial sound of the subject 'il'). In addition, the 't' sound tends to be more linked to the syllable that follows it than to the verb that the 't' actually belongs to, which is why it is written above as ai'-TEAL instead of ait-eel. This question can also be turned around into a less formal question form: Il est quelle heure? is a very idiomatic, natural way to ask the question in passing. On the street with strangers, you would use the traditional question; at home with your sister, you'd probably use this variation. Note that the il est in this case can be swallowed and pronounce y (for English pronunciation: eeee) or y-ai (in English: eeee-ai). While you might recognize the formal question if someone asks it to you on the street, this informal version might throw you for a loop if you're not ready for it. Another variation is to ask someone (formal): Avez-vous l'heure?, or slightly less formal: Vous avez l'heure?. These translate into the English question: 'Do you have the time?'. Lastly, if you really want to practice your highly formal French phrases, try auriez-vous la gentillesse de me dire l'heure? or pourriez-vous me dire l'heure?. These phrases should be used with caution, as anyone under the age of 50 would probably wonder why you are asking such a fancy question if you ask for the time this way. On the flip side, if you're at a black-tie wedding in Paris, these phrases will fit in perfectly. While 'what time is it?' may be a simple question, like many things in language, there are several different ways to say it, and each one lends itself to a different time and place where its usage is most appropriate.